Is It Time For New Thinking On Fighting Wildfires? Clearly the present methods are not working !!! Firefighting basically has not changed in hundreds of years. Sure we have modern fire suits and oxygen but really the fire fighters are either cutting fire breaks or spraying water. It’s kind of ludicrious when you think about it. Fire fighting has not changed much in a hundred years and we;re witnessing the results in Northern and Southern California. 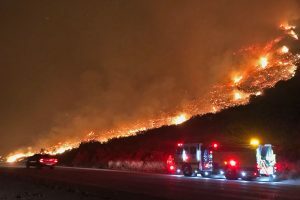 Only fixed wing and rotary aircraft seem to provide any real effect on these out of control fires and they are too few and far between to make any real difference. 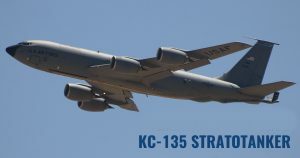 Well the U.S. Air Force has 414 Refueling tankers called KC-135 and they’re slowly being phased out which means these tankers are going to be available in significant numbers. Rather than mothball them in the desert why not give them to states for firefighting? The KC-135 has a tank capacity of 200,000 pounds. A gallon of wayer weighs 8.5 pounds. That means a KC-135 could carry 23,500 gallons of water. Take a KC-135. Drain the fuel and flush the tanks. Fill it with 23,500 gallons of water. Fly over a fire area and dump the water out the boom. Let’s not be timid here. Why not TEN KC-135 tankers? Imagine if you will ten tankers flying wingtip to wing tip and all dumping 235,000 gallons of water on any fire. We think such fires will be under control rather quickly. And it wouldn’t matter if the area was populated or not – it’s only water. And if the Air Force needs them back? Just fill them back up with fuel again. And it just so happens we have more than 48 of these aircraft right in Northern California at Travis AFB. ← Raspberry Pi with Stretch – Static IP, Video Streaming, and Scheduling a Program.